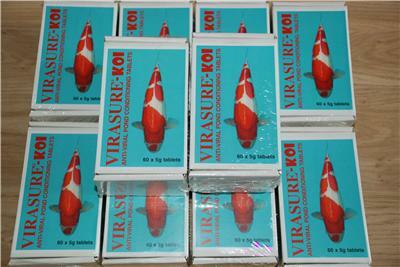 Description: "The most advanced virucidal disinfectants available to mankind, killing all major known virus families including Herpes Virus; uniquely safe in the aquatic world, this product now leads the fight against the viral challenge, for all Koi Keepers. Used as a pond conditioner it greatly helps control harmful levels of virus and bacteria in your pond, and can improve Koi Health"
"The most advanced virucidal disinfectants available to mankind, killing all major known virus families including Herpes Virus; uniquely safe in the aquatic world, this product now leads the fight against the viral challenge, for all Koi Keepers. Used as a pond conditioner it greatly helps control harmful levels of virus and bacteria in your pond, and can improve Koi Health"